In Budapest, this is the most common chicken soup recipe for Jewish Penicillin. 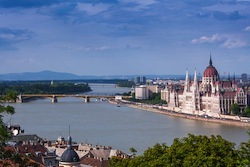 Budapest, and Hungary as a whole, has a deep Jewish history. Prior to World War II, the Jewish population reached more than 600,000. After the war ended, their numbers were diminished greatly, but community passion and dedication survived and populations started to grow once again. Today there are approximately 110,000 Jewish people in Hungary. Wash chicken in cold water. Peel celeriac and cut into strips. Wash cauliflower and break off florets. Peel skin off onions and garlic. Place chicken in large pot and cover with water. Bring chicken to a boil and skim foam as needed. Add tomato, salt, paprika and peppercorns to chicken. Simmer for about one hour. Boil peas, celeriac, carrots and cauliflower in water for 10 minutes. Cook vermicelli in boiling water for three minutes then drain. Remove chicken from pot and take meat from bones. Cut meat into cubes and mix with vegetables and vermicelli. Place individual portions in soup bowls and cover with broth. This Budapest Hungarian Jewish Penicillin uses many of the same ingredients as other chicken soup recipes with the addition of celeriac and tomatoes. Peppercorns may be placed in cheese cloth and removed before serving to prevent biting into one after serving. Fighting cold in pregnancy can involve over the counter medications, but some pregnant women feel uncomfortable taking any medicines while pregnant. Cold in pregnancy can be treated with chicken soup or Jewish Penicillin.